7.2-channel AVENTAGE model features enhanced sound quality, high power and exceptional functionality. Compatibility with these amazing sound technologies transports you from an ordinary moment into an extraordinary experience. They deliver breathtakingly rich and realistic surround sound, positioning and moving individual sounds to any virtual point in your room, including objects moving overhead. Experience the overwhelming realistic movement and immersion in videos — right in your home theatre room. This unique Yamaha proprietary sound field creation technology, was created by combining measured sound field data with digital signal processing. Yamaha collected sound field data from famous concert halls and music clubs around the world, utilising its wealth of experience in the fields of concert hall design, public address and mixing. By digitising that vast trove of information and incorporating it into dedicated LSI devices, it effectively reproduces the spaces of those concert halls on home equipment. Immerse yourself in the astounding realism of your movies, and enter a world of profound theatre sound. The Anti Resonance Technology (A.R.T.) Wedge is a fifth foot in the centre of the unit. It dampens vibrations from the power transformer, power transistors and heat sinks, as well as vibrations that might be caused by the sound from the speakers — providing dynamic sound and focused, accurate reproduction. YPAO-R.S.C. 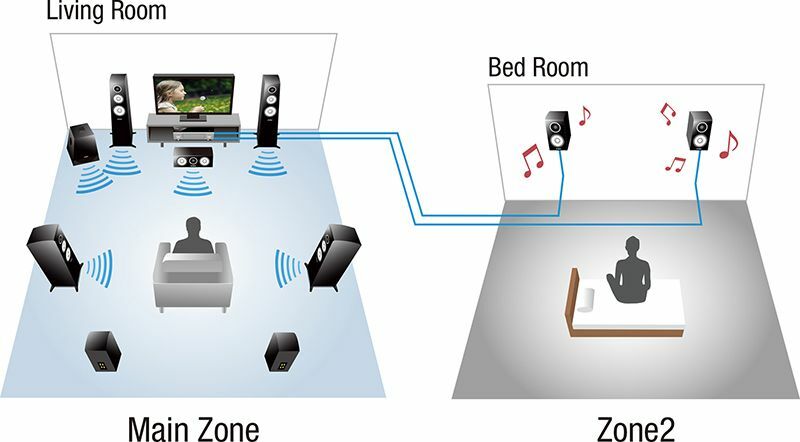 (Reflected Sound Control) analyses room acoustics and measures various speaker characteristics, then calibrates audio parameters to achieve optimum sound at any of eight listening positions. It employs Reflected Sound Control to correct early reflections for studio-quality sound. It also provides DSP Effect Normalisation, which varies the CINEMA DSP parameters according to the reflected sounds. It’s like having a professional installer calibrate your system, creating an ideal listening space with perfectly balanced sound — even over a wide area in larger rooms. 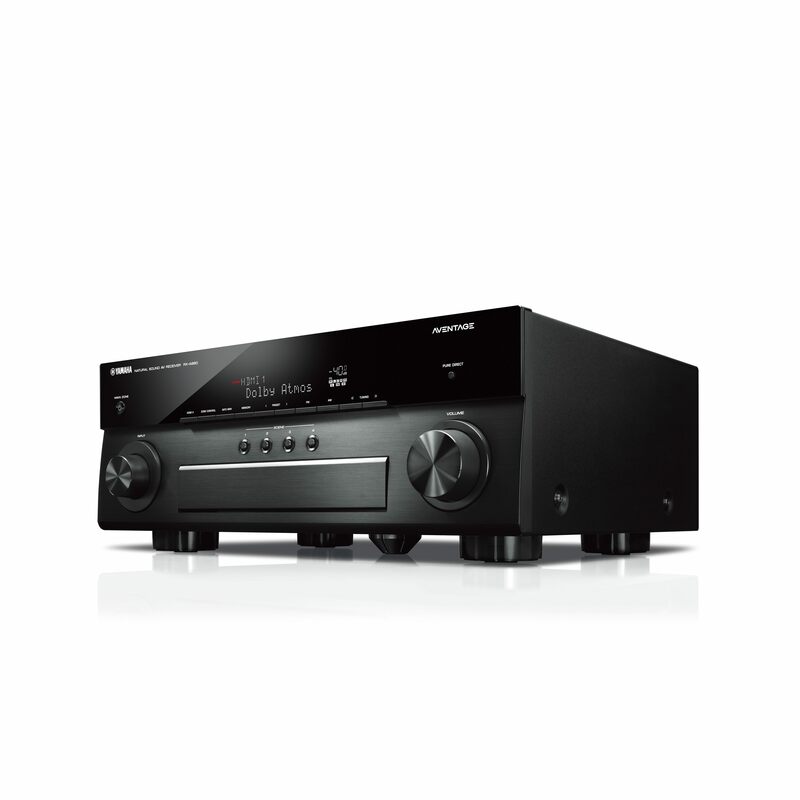 Yamaha AV receivers feature fully discrete power amplifiers to minimise distortion and adopt independent pure power supplies for the analogue and digital circuitry. They also feature ultra-high performance with 384 kHz / 32-bit DACs, also with Independent power supplies, for reproducing absolutely all the audio in High Resolution sound sources without noise. A new high sound quality IC is employed for volume control and large heat sinks suppress vibration. Down to every detail, these AV receivers are designed with full emphasis on the highest possible sound quality. MusicCast takes the headache out of multi-room audio. Simply connect all MusicCast devices to the same network and start sharing audio throughout the home. Take MusicCast for a test drive by downloading the free MusicCast app and using it demo mode. Explore a world of music with music streaming services* built-in. Syncing your playlists and song likes from your smart phone or computer to the RX-A880, music streaming services make it impossibly easy to either listen to your faves or discover new music. * Music streaming service availability varies by region. With the power of CINEMA DSP 3D, the Virtual Presence Speaker function makes full use of centre and surround speakers to create audible information from where presence (height) speakers are normally installed. In addition, this model also features a Virtual Surround Back Speaker function. Even without using surround back speakers, you can experience more natural surround sound thanks to CINEMA DSP 3D playback — giving you the virtual equivalent of up to 9.1-channel surround, even with a 5.1-speaker configuration. * Dolby Atmos and DTS: X signals cannot be used with these virtual features. Since the RX-A880 has two HDMI output terminals, simultaneous connection to the TV and LCD projector is possible. Which means you can use your TV as usual but use the projector for your favourite movies and special programming — easily and without having to change any connections. The built-in HDMI functionality is of the latest specifications, corresponding also to HDR (Dolby Vision Compatible, Hybrid Log-Gamma), 4K / 60p passthrough & 4K upscaling, and so on. 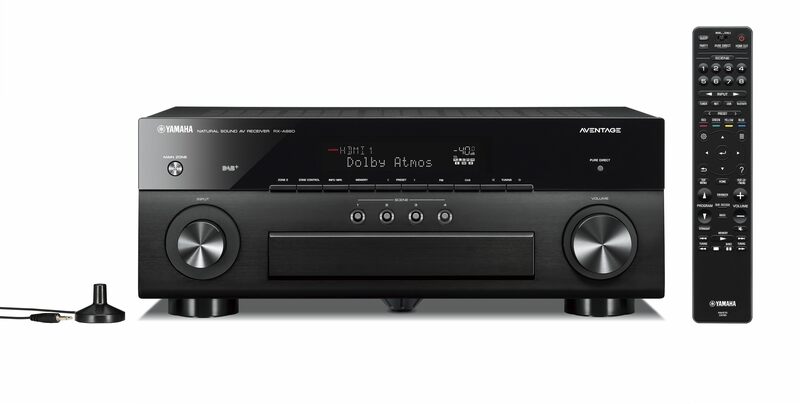 This AV receiver provides phono input terminals, letting you connect a turntable and enjoy music from your vinyl collection. Digital Audio Broadcasting capability, with DAB and the enhanced DAB+, offers a large selection of radio stations with high sound quality. Other benefits include automatic selection of available stations from a convenient list, and helpful information display, including station name and music genre. * Availability of DAB / DAB+ tuner function varies by region. “Alexa, ask MusicCast to play Favourite 1 in the Kitchen.” With Alexa voice control integration, all you have to do is ask. The RX-A880 name offers full compatibility with Amazon’s range of voice control devices. Welcome to the smart home. * Availability of voice command control via Amazon Alexa varies by region. This easy-to-use app lets you conveniently and ‘smartly’ control your AV receiver’s power, volume, input selections, DSP modes — and much, much more — from an iOS or Android™ device. You can also use as many as 23 different languages and customise the interface by hiding unused icons and renaming functions. A tablet version is also available. 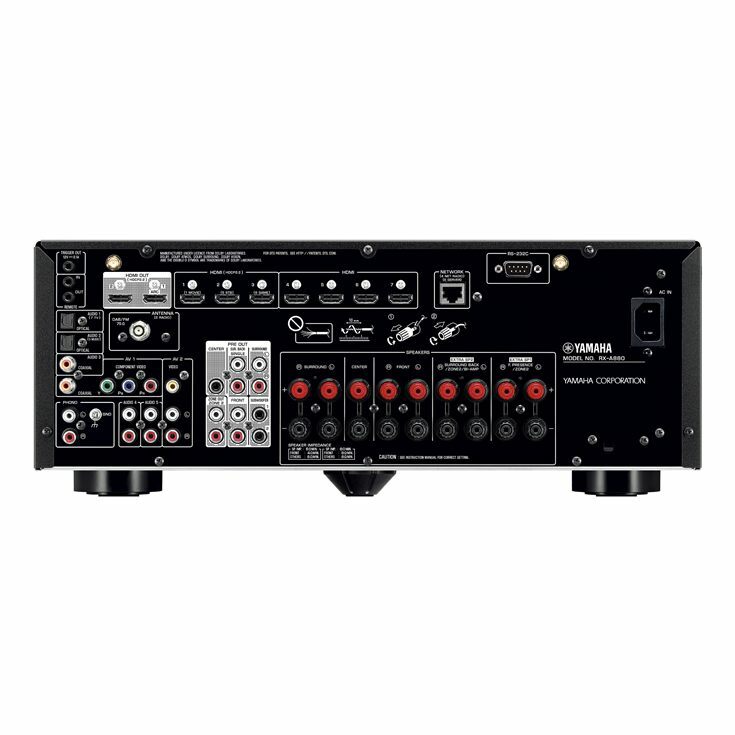 The latest graphical user interface from Yamaha has a high-resolution display with clear, easy-to-use menus and includes a selectable status bar that shows input source, volume level, DSP mode and audio format. The GUI provides a choice of eight languages: English, French, German, Spanish, Italian, Russian, Japanese and Chinese and can be displayed over both normal and 3D pictures. Featuring Zone2 compatible speaker terminals, this system can send the same (or even different) AV contents playing in the main room for playing in another room. For example, if you’ve got speakers installed in your bedroom or kitchen, you can go to that other room and enjoy listening to the same or different main room content. This AV receiver features bi-amping capability, driving the treble and bass ranges of the front speakers (L, R) with independent amplifiers, making it possible to enjoy even higher quality sound from the front channels — an important consideration in home theatre setups. The Compressed Music Enhancer from Yamaha is now optimised for Bluetooth audio transmissions to ensure that your music will have vivid, energetic sound quality during wireless playback. This special app assists you with cable connections between the AV receiver and source devices. Additionally, it guides you through various settings such as speaker connections, TV and source device connections and power amplifier assignments. When ECO Mode is turned on it can reduce power consumption by about 20 percent*, thanks to an advanced energy saving design. *Compared to power consumption when ECO mode is off (Yamaha measurement). Weight 11.0 kg; 24.3 lbs.